What is it that fuels your desire to share music to an audience? Is it a job? Extra income? A way to meet and impress people? Or is it more than that? Is it your escape? Your therapy? Your passion? This website is dedicated to those who have the music in them. To me, what constitutes someone as being a “good DJ” has very little to do with what media format they choose, what type of music they play, or their level of technical skill. I feel like it doesn’t matter whether or not you use a “sync button”, the type of gear you use, or the genres of music that you choose to share. Good DJing is about adaptation, observation, and psychology. I don’t mean to imply that DJing is anything but playing someone else’s music. And these days, it seems like everyone is a DJ. There is still a difference between having a live music selector and an iPod, regardless of the fact that technology has gone a long way in closing the price of entry (both monetarily and in the need for technical skill). Jlust because everyone has access to a pencil and paper, it doesn’t make everyone an outstanding sketch artist. Your kitchen is full of pots and pans, appliances, and recipes which allow just about anyone to make a decent meal. But that doesn’t inherently make you a gourmet chef. I have trouble understanding why many DJs feel devalued because of the accessibility of the hobby. It’s true that, with the advent of high-speed Internet access and the development of various technologies, there are a lot of less-than-stellar DJs out there (as well as producers/singers/songwriters/photographers/rappers/web designers…. you get my drift). But that doesn’t take anything away from what you do. I have a much more optimistic view on this than many of my colleagues. I like to think that it’s more important than ever to be good at what you do. Do you come from a time when your ability to hold a mix transition together for longer than a minute is what made you special? Or was it your extremely rare white-label records that set you apart? Has all of this new technology and the changes in the industry made you lose your ace in the hole? There’s nothing wrong with hanging up your headphones if you no longer have the fire you once had. But if you’re like me, you have a passion for sharing music. I enjoy seeing them enjoy it. I love the psychology. If you’re feeling under-appreciated, perhaps you might reconsider the types of venues you’re playing, your target audience, and your approach. here are ways that you can provide value as a DJ outside of the way you handle transitions… and the DJ who realizes this is worth his weight in gold. It’s the difference between competence and distinction. I don’t care if we’re talking about an illegal rave, a small art show, a wedding, a music festival or an Internet radio station. Plenty of people can do it. You should be thinking about how you can do it better. If this is truly a passion of yours, you owe it to your craft to do what you can to do it with heart. If all it takes is the noise of lukewarm DJs to coax someone into early retirement, then perhaps they weren’t as passionate about it as they thought. So how can we feel fulfilled? How can you stand out amongst a crowd of competent (but mediocre) DJs? I’ve noticed that since I’ve become better at choosing where and when I will play, something pretty neat started to happen. I started to feel appreciated. In my earlier DJing days, I once played at a local night club which was known for playing hip-hop. And I learned a hard lesson that many DJs still haven’t learned after trying for years and years. I tried to force it. And, it went over like a lead balloon. A local club owner I know once referred to this approach to DJing as “musical masturbation”. I ended up scrambling together the few hip-hop tracks I happened to have with me to save face, which barely worked. The lesson: know what you’re getting in to, and act accordingly. This doesn’t mean that you have to arrive at every gig with every style of music, and compromise your own sense of style and musical taste in order to water it down for the masses. It simply means that you shouldn’t pigeonhole yourself if you want to provide value. I know that when I play a fashion show in a night club, I need to play music that is upbeat and bouncy without being too obnoxious or vocal. I know that when I play an underground event at a warehouse somewhere, my crowd is going to be bored to tears if I play 95bpm jazzy trip-hop. Big wobbly dubstep tracks don’t typically belong at a coffee shop at 8 PM. What is it that gives you joy when it comes to playing music to a crowd? Do you do it because it’s a a job that scores you some extra beer money? Is it for that one person that gives you kudos at the end of the night? Is it that it makes you feel good to see the download counter increase when you post a mix on your website? Do you enjoy the control of the dance floor? Whatever it is, honestly recognize, and then act accordingly. Lying to yourself about what you like is a great way to feel unfulfilled. And if you truly don’t enjoy it, consider letting it go. But if you love this thing as much as I do, I hope you will do it with heart. 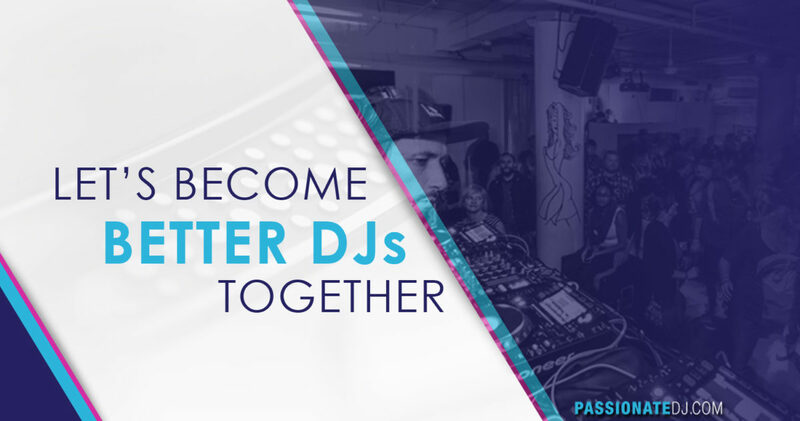 If you want to join us in our journey to become better DJs through passion and purpose, tune in to our weekly talk show, The Passionate DJ Podcast.